Michael Bolton: What’s up, G? Peter Gibbons: Want to go to Chotchkie’s? Get some coffee? Samir: Oh, it’s a little early. Peter Gibbons: I gotta get outta here. I think I’m gonna lose it. Female Temp: Uh-oh. Sounds like somebody’s got a case of the Mondays. Oh noes…a case of the Mondays is not good! Not on any day! It’s so easy and has very pleasing results. Be gentle with the eggs unless you are a pro. If you don’t have a handy dandy egg slicer which, might I add, would not prevent you from having to slice the opposite direction anyways, then a patient hand is the key. Dice and cut the eggs how you please. None of the eggs will stay completely intact through the stirring process. Finely chop the celery stalks and green pepper too. Onion powder saves the day in this recipe, although some freshly cut red onion could add some more color and crunch. Behold my chopped celery disguising as chopped green pepper and my beautifully yellow egg yolks next to their little chopped egg white pals. Add 4 cups of mayo and you’re set. 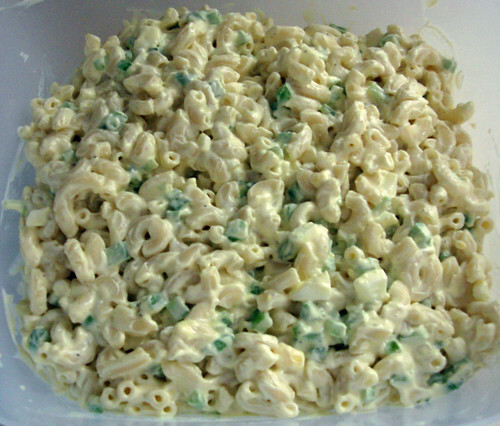 I have never prepared macaroni salad before, so I misjudged mayo requirements while at the store. I also forgot my neat table for metric conversions and such so I thought this container would be plenty. This container of mayo falls just short of 4 cups by the way. But you know what? It’s Monday and it does not matter! This makes a lot of salad, but if sealed properly could last up to 4 days in the refrigerator. Bring a pot of lightly salted water to a boil. Add macaroni and cook for 8 to 10 minutes, until tender. 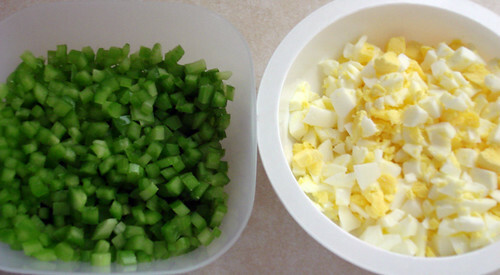 In a large bowl stir together the eggs, celery and pepper. In a small bowl stir together the mayonnaise, mustard, pepper, salt and onion powder. Combine into the bowl with the eggs and vegetables and stir macaroni until well blended. I think this is the best macaroni salad I have ever eaten and I swear I’m not just saying that because I made it. I didn’t use level tablespoon measurements when dispensing the mustard, but I enjoyed the outcome. Four tablespoons of mustard must be when the magic happened. If you like the taste of mustard potato salad, then you’ll love over-lapping the three mustard tablespoons. I think I recreated that taste in macaroni salad form, but I liked it! And with that, enjoy a Milton clip. That poor guy couldn’t even enjoy my M-m-m-macaroni Salad if he tried. Give the brother a slice of cake! !